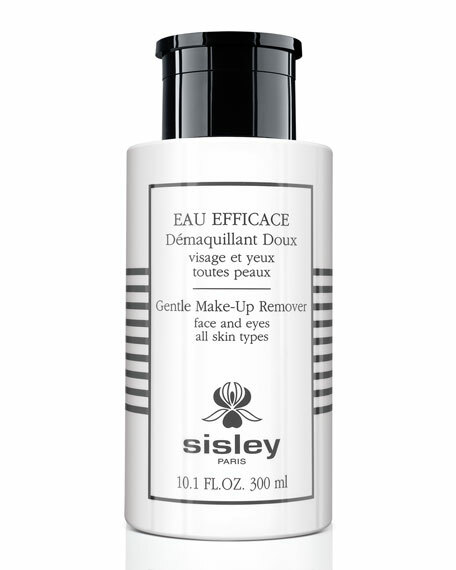 To remove face and eye make-up and tone the skin in one single sweep, Sisley has created Eau Efficace, a gentle, sensory, high-performance and non-rinse cleansing lotion. Formulated with deeply cleansing plant-based saponins, Eau Efficace removes surface impurities and traces of pollution accumulated during the day, and helps preserve the skin's natural radiance. Applied with a cotton pad, it effectively removes face and eye make-up, even long lasting, leaving the skin clean and matte, and the complexion fresh and glowing. Press gently on the pump to soak the cotton pad with Eau Efficace. First remove eye make-up, followed by face make-up, and repeat if necessary. No need to rinse. Suitable for all skin types including sensitive skin. Suitable for contact-lens wearers and sensitive eyes as well.